A warm welcome to old friends and new subscribers. I hope you'll find this issue of Nose to the Ground interesting, useful, and fun to read. Hot, hot weather though we've had a bit of a break the past couple of days. It's actually been hotter in Montana than in Texas and Arizona for much of July! So it's time to move a bit more slowly and on some days not much gets accomplished but we did give the horses their West Nile virus shots today. The number of occurrences in Montana and neighboring Idaho is up from last year but still relatively low compared to some other parts of the country. Received responses to several Montana Horseback Vacations links earlier this spring. I hope none of you scheduled a visit here in late July (despite any recommendation I may have made) as we're in the midst of an outbreak of forest fires including three rather sizable ones in our part of the state. A couple of times we've had ashfall (from 30 miles away) and one day it got so dark that headlights on the horses would have been in order. Of course the horses aren't worked when things get that smoky. At least we haven't as yet had to consider transporting them elsewhere. The fires will die down soon and Montana is wonderful horseback vacation country (a very good source for horseback (and other types of) vacations is at www.RealAdventures.com). When I'm introduced to a new online business that has something promising to offer (and these are for the most part small niche businesses), I like to share with you. Here are three interesting web sites, the first I think you'll find particularly unusual, at least as far as horse art is concerned. United Kingdom artist Heather Jansch had created some truly fantasic equine artwork using "drifwood". I first saw her work in an e-mail my daughter sent, one that apparently has been circulating around the Internet and you may even have seen. These aren't pieces of wood cobbled together to somewhat resemble a horse, but are truly beautiful art forms. The image of "Beethoven" shown here is just one example. Take a trip to Heather Jansch's website and be prepared to be amazed! For horseback vacation destinations I usually stick pretty close to home and places I know best. Once in awhile I come across a spot that I know I'd like to visit if I had the chance. I found such a place in the UK and will pass it on to you. If you've been thinking of some horseback riding in that part of the world a trip sponsored by the Epworth Equestrian Community might just be your "cup of tea". Our Fjord Nessi, true to form, is starting his winter coat, just after the warmest July on record and several weeks of hot weather still out there. Again, true to form, he'll probably start shedding in January well before the end of the cold season. A wonderful and amazing breed those Fjords. Nice gift too if you've a horse in mind. Willow's Edge Farm in Western Washington, not far from where we once called home, breeds Norwegian Fjords. They have a new website which you ought to see to find out more about the breed. You can also see our article on Fjords for additional information. 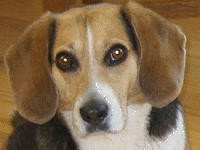 It's always difficult to lose a beloved pet, Early this montn we lost Boo, our oldest beagle and the initial inspiration for this newsletter. She was 9, a bit too young to leave us I think - but that can happen. When pets become ill they often take a sudden turn for the worse. I'll keep her picture on the web site . Roving reporter Clancy now has to handle the work of two beagles. He's kind of a goofball at times but I'm sure he's up to it. If you've authored an equine article you'd like to share, please contact us. Of course you'll get full credit and a link to your website when it's published. Rules of Thumb for Saddle Fit - Some things you should know if purchasing a saddle for the first time. It does have to fit (rider and horse). Saddle Rigging Demystified - explains the basics of western saddle rigging. This article contains most everything you need to know unless your needs are very special. Horse Art - Eadweard Muybridge, Leland Stanford and the Hobby Horse - One individual is well known, the other less so, but what they accomplished together changed horse art forever. What goes on in the mind of the horse artist as they create their work? - I asked this question in a recent edition of our newsletter and received a very nice reply from our favorite European artist. How to Build an Inexpensive Round Pen - Some posts, electric braid, a home made gate and a touch of green paint produced this "world class" pen.